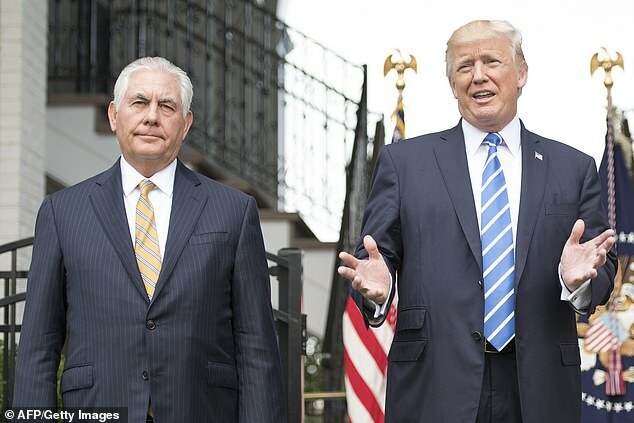 President Donald Trump insulted his own former secretary of state Rex Tillerson as ‘dumb’ and ‘lazy’ hours after the former diplomat revealed he considered Trump an impulsive force with no conception of how he was constrained by law or treaty. 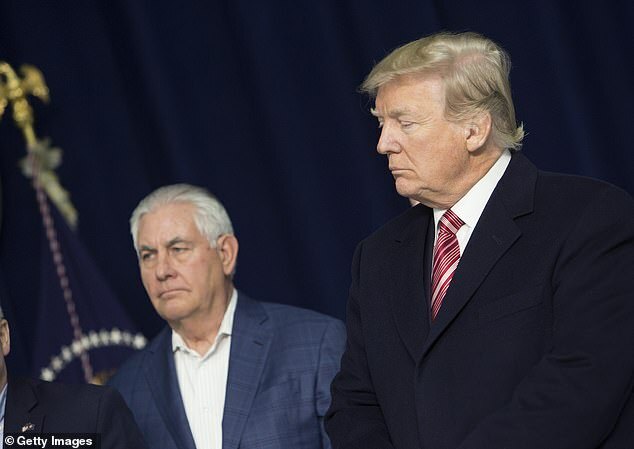 Trump weighed in hours after clips circulated of Tillerson sharing his apparent criticisms and reservations about the man he served for a year as secretary of state. Tillerson had called his former boss ‘undisciplined’ and said he didn’t even like to read his briefing books before issuing pronouncements. ‘Mike Pompeo is doing a great job, I am very proud of him,’ Trump countered on twitter, mentioning Tillerson’s successor before tearing into the wealthy former oil CEO. 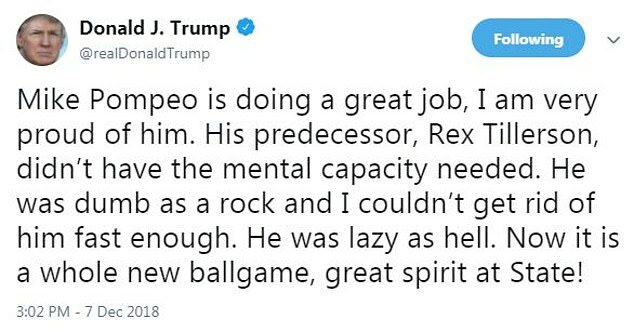 ‘His predecessor, Rex Tillerson, didn’t have the mental capacity needed. He was dumb as a rock and I couldn’t get rid of him fast enough. He was lazy as hell. Now it is a whole new ballgame, great spirit at State!’ he concluded. Tillerson had described President Trump in an interview as someone almost entirely driven by impulse, who doesn’t read, and who would ask him to break the law or breach treaties in his demands for immediate action. The former oil man got an engineering degree at the University of Texas at Austin, joining Exxon in 1975 and rising to run the company and bank millions upon his resignation to join the Trump White House. 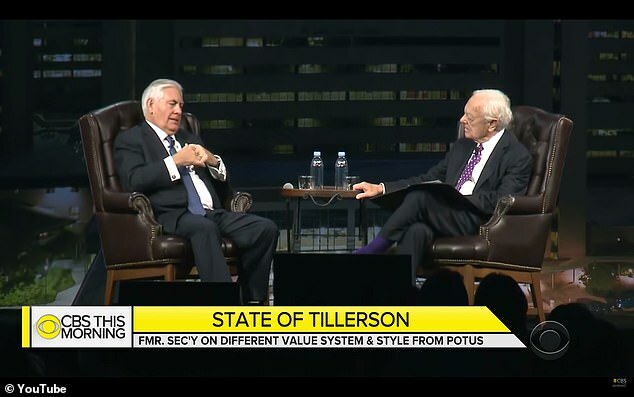 When veteran TV host Bob Scheiffer asked him a pair of questions at a fundraiser for the MD Anderson Cancer Center in Houston, he laid into his former boss, who had put Tillerson through the humiliation of an extended departure after he had lost patience with him. ‘It was challenging for me coming from the disciplined, highly process-oriented Exxon Mobile corporation to go to work for a man who’s pretty undisciplined, doesn’t like to read, doesn’t read briefing reports, doesn’t like to get into the details of a lot of things but rather just kind of says look this is just what I believe and you can try to convince me otherwise but most of the time you’re not going to do that. ‘I had never met Donald Trump until the day he asked me to be secretary of state. He acts on his instincts. In some respects that looks like impulsiveness. But it’s not his intent to at on impulse. 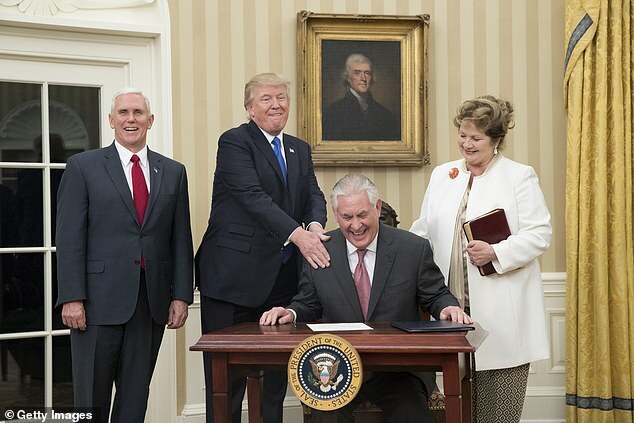 I think he really is trying to act on his instincts,’ said Tillerson. He continued: ‘We are starkly different in our styles. We did not have a common value system. When the president would say, “Well here’s what I want to do and here’s how I want to do it,” Tillerson explained. ‘I think he grew tired of me being the guy every day that told him you can’t do that and lets talk about what we can do,’ he said. After an extended answer, Schieffer responded: ‘That’s very very interesting,’ prompting laughs from the crowd. ‘Well it is,’ he defended himself. In other remarks, Tillerson said at times, ‘If that’s what you want to do, there’s nothing wrong with that. I told him I’m ready to go up there and fight the fight, if that’s what you want to do,’ the Houston Chronicle reported. He also revealed he is no fan of the president’s favorite social media platform, Twitter, which often threw him to explain new policy ideas on North Korea or other hot topics during his tenure. 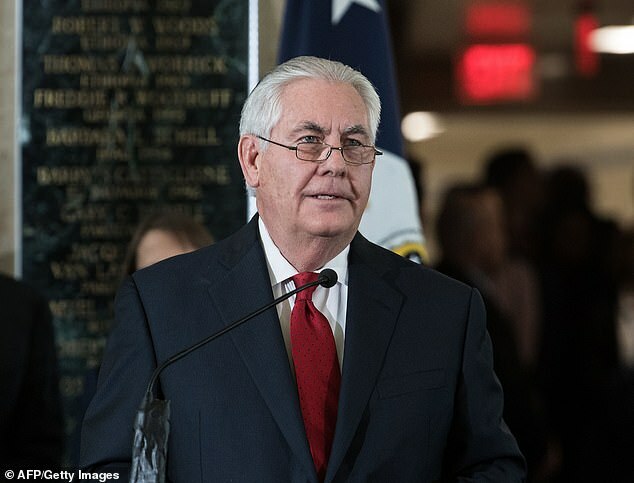 Tillerson, who was pushed out after Trump repeatedly goaded him on Twitter, got fired about nine months ago when chief of staff John Kelly to break the news. Kelly told reporters in an off-record event that got leaked that Tillerson was suffering from a stomach bug on a trip to Africa at the time and was on the toilet. The disclosure was taken as yet another slight. ‘Dumb as a rock’ is one of the president’s go-to sleights. He has also applied it on Twitter over time to MSNBC host Joe Scarborough and CNN host Don Lemon. Other media or political figures to earn the swipe include Jay Leno, Jeb Bush, Chris Mathews, and Mika Brzezinski. Earlier Friday, Trump made revealing comments about his views of loyalty and performance while praising Missouri Senator-elect Josh Hawley, whom he praised. ‘In life you never know. You pick somebody, looks good, sounds good, think he’s smart. And then they choke. They choke like dogs. And you say, “What did I do, I picked the wrong person.” Well we saw a lot about Josh and we thought he’d be great. And I’ll tell you he had a tough race against a very tough competitor,’ Trump said. Trump issued several tweets about Tillerson while he was in office, sometimes putting heat on him, other times backing him up. 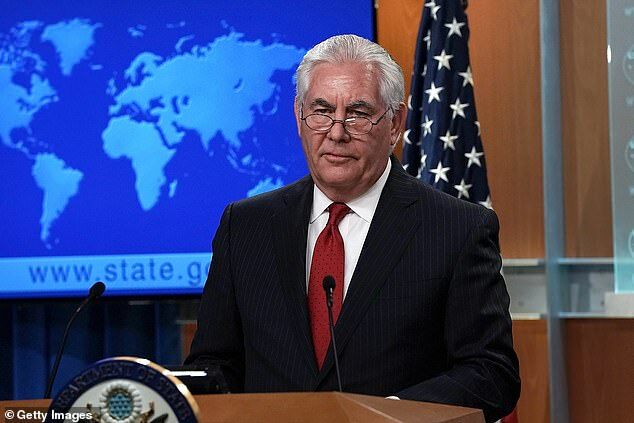 ‘The media has been speculating that I fired Rex Tillerson or that he would be leaving soon – FAKE NEWS! He’s not leaving and while we disagree on certain subjects, (I call the final shots) we work well together and America is highly respected again!’ Trump wrote last December. In a famous missive from October, he wrote: ‘I told Rex Tillerson, our wonderful Secretary of State, that he is wasting his time trying to negotiate with Little Rocket Man,’ a reference to North Korean dictator Kim Jong Un.